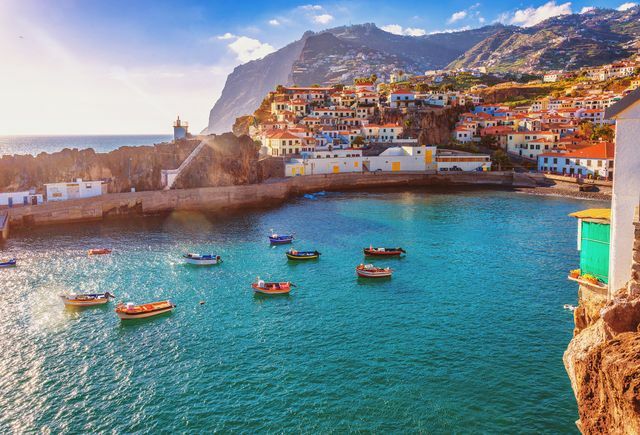 Portugal is a fascinating country full of picture-perfect beaches, lush mountain ranges, eclectic architecture, rich history and an unrivaled wine and food scene. Kick off your marriage in a country that’ll wine, dine, and romance you. Portugal honeymoons are totally hot right now because of the country’s unique mix of breathtaking beaches and centuries-old architecture. As one of southern Europe’s largest countries, you and your S.O. can get lost in the grandeur of Lisbon, indulge in the tastes of Porto, or even swim in crystal-clear water in Algarve. There’s something for every couple during a honeymoon in Portugal, whether you’re looking for adventure, TLC, or a little bit of both. 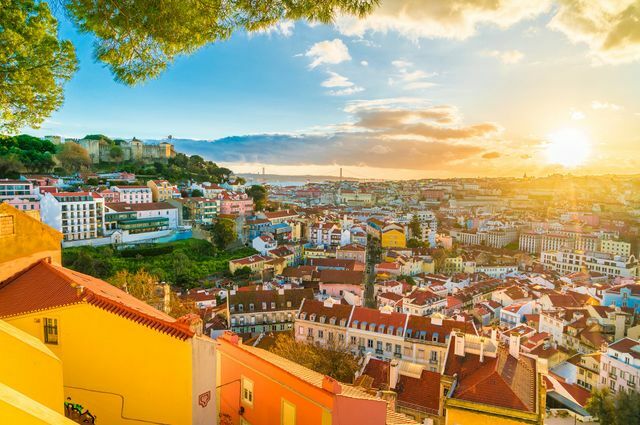 Follow this itinerary for a Portugal honeymoon that you’ll cherish forever. Unlike other European countries, Portugal isn’t nearly as busy — dare we say, toursity — as others. That means if you’re afraid of crowds, then there’s no need to be. Weather, on the other hand, is another story. Portugal has fairly mild weather throughout the year, but for beach-ready temperatures, visit during the summer months. If you’re going to spend your time inside museums and cathedrals, March to May and September through November are best. No Portugal honeymoon is complete without a pit stop in Lisbon, the country’s capital. The centuries-old city is dressed with cobblestone streets, ancient ruins, and some of the coast’s most breathtaking cathedrals. Get up close and personal with Torre de Belém, a gothic tower that dates back to the 1500s. And while you could easily spend your days gawking at St. George’s Castle or the Monastery of Jerónimos, the real charm is found in the less touristy spots. To get a full view of the city, hop on Tram 28 to explore the quiet streets of old Alfama district. But if you really want to see what all the hype is about, take a pitstop to look at the area’s tile-fronted buildings, cathedrals, and scattered ruins. Must See: Experience all that Lisbon has to offer with a food and wine tour to sample the country’s specialities. Just don’t eat a big lunch beforehand. Porto like port wine? Exactly. Get some much-needed R&R by visiting this coastal city in northwest Portugal. Although it was once a mercantile city thriving on business and trade, Porto is now known for its modern architecture, sprawling gardens, and quality wine. If you’re looking to catch some sun, head to the city’s most popular beach, Matosinhos. For a dose of history, visit the Church of São Francisco to see the last Gothic monument in Porto, which was completed in 1425. Just a few minutes away, Palácio da Bolsa a.k.a. Porto’s old stock exchange boasts with its Neoclassical design and luxe decor. Must See: Sure, there’s wine. There’s also Serralves Museum & Villa, a gorgeous Art Deco property, that makes for a full day out and about. Just 45 minutes north of Lisbon, you’ll feel like you’re straight in a fairytale. In fact, it’s just one of Portugal’s most picturesque resort towns. For an air of mystery, check out Quinta da Regaleira, a 20th century Gothic complex with a palace, chapel, and gardens. So, what’s the mystery? A former owner of the estate added symbolism throughout the grounds that have left guests guessing for years. One things guests know for sure: The landmark’s Initiation Well is one of the best spots to take a photo in Sintra. 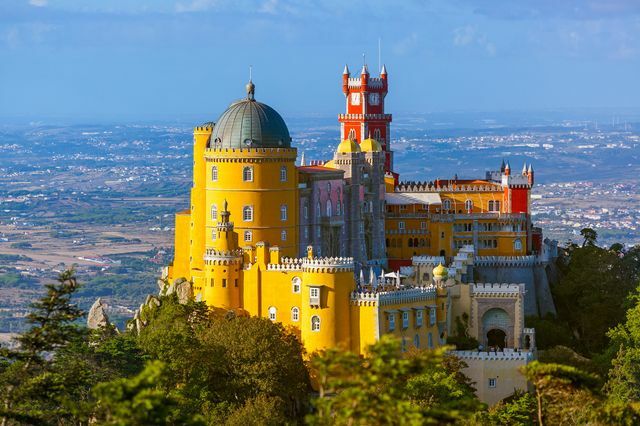 Speaking of Instagram-worthy sights, give yourself options by snapping more pictures at Parque da Pena, the stunning grounds surrounding Pena Palace. Must See: Indulge in travesseiro, a flaky pastry filled with egg cream and flavored with almonds. If you want the best of the best, visit Casa Piriquita, a 155-year-old shop that locals love. Some might say that this riverside town should just be a pit stop on your Portugal honeymoon — but they’re wrong. Like other cities in the area, Coimbra seamlessly blends history, art, and modern attractions. Go back to your glory days at Universidade de Coimbra, one of the world’s oldest universities. It’s not all about books and backpacks: This UNESCO World Heritage site is basically a work of art with an impressive library, art gallery, and chapel. To keep with the historic theme, the Chapel of São Miguel takes you back to the 16th century with Neoclassical art and Manueline carvings. Must See: Once you’re all history-ed out, take a breather at Parque Verde do Mondedo alongside the Mondego River. Here, you can picnic, bike, run, or just take a seat as you soak in the city’s sights and sounds. 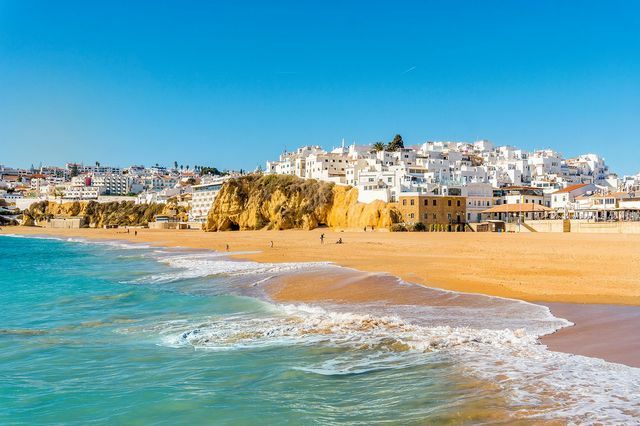 For the true Mediterranean experience during your honeymoon in Portugal, kick back, relax, and soak up the sun in Algarve. Portugal’s southernmost region. The beaches are a standout: There are more than 150 (!) to choose from, which means there’s bound to be one (or two) to fit your needs. At beloved spots like Praia da Marinha in Lagoa, you’ll get a taste of Algarve’s crystal-clear water, rock cliffs, and sea caves. If you really want to feel like you stepped into postcard — don’t we all? — spend a morning walking along Ponta da Piedade, the limestone stacks and cliffs south of Lagos. And if you’re brave enough to walk down the 190 steps, you’ll get an intimate look at the cove and it’s arches. Must See: The beaches, for obvious reasons. Bring on the romance by watching the sunrise or sunset through Benagil Cave’s circular skylight ceiling. After your wedding, you need to unwind … like yesterday. Fly straight to Porto to kick off your trip nice and slow. 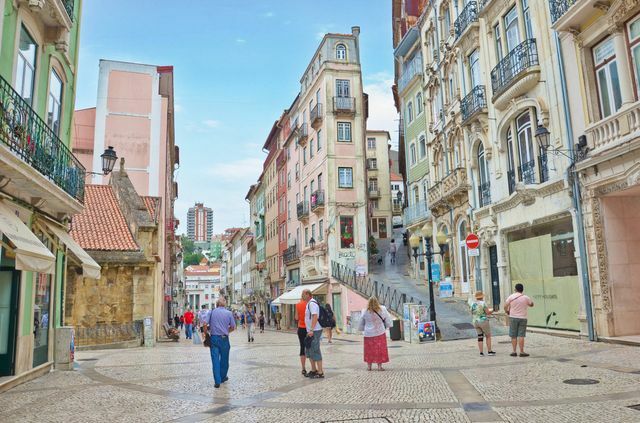 Ease into Portugal’s vast history and architecture with a day or two in Coimbra. Just a two hour drive away, make a pit stop in Sintra before heading to the country’s capital. Round out your trip with even more history, architecture, and delicious food in Lisbon. And finally, end things on a romantic note by taking a 45-minute flight to Algarve.